UPDATE: THIS PATTERN IS NOW AVAILABLE IN AN EASY-TO-PRINT PDF FORMAT, AT THE KNITTING PATTERNS LINK, ABOVE. Yes, it’s been dark here longer than usual at String. My life has not been my own, with raging work-related deadlines consuming every inch of me. But in spite of those, I had a special commission from The Resident Male. 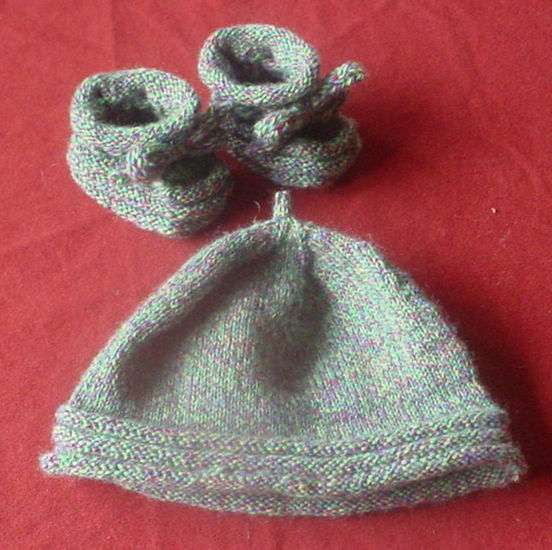 He asked me to do some baby knitting for a workpal of his, whose wife is expecting. So I whipped out my needles and made up a pair of standard booties, from the Ann Kreckel pattern I favor, and improvised a matching hat. I’ve posted about the booties many times before, including an illustrated tutorial. My matching hat is a simple beanie shape knit in the round, with three welts around the bottom edge to match the three welts that run around the sides of the stay-on bootie. I know that many other people enjoy making these booties, so I share the matching hat pattern here. For the record, my hat is on the small side and should fit a petite newborn. I haven’t tried it yet, but using a 1.75mm (US #00) or a 2mm (US #0) at a slightly less extreme gauge should produce a hat for a larger newborn and 3 month size, respectively. If you want to work this at a standard gauge of 7 stitches per inch but end up with the same size hat as I made, cast on 100 stitches, and place your markers every 20 stitches. Follow the instructions as written EXCEPT that instead of following the (K23, K2tog), (K22, K2tog) or (K21,K2tog) directions instead ALWAYS knit until two stitches remain before your marker, then knit those two stitches together. I had plenty of yarn left over from my hat and booties from my one 50 gram skein of sock yarn, you shouldn’t run out even if you knit a larger hat or a hat at a less extreme gauge. Using a very stretchy cast on (I used half-hitch) cast on 120 stitches and divide among your needles. If you are using one or more circs, mark the beginning of the row with a stitch marker for convenience. Knit 12 rounds. Purl 4 rounds. Knit 4 rounds. Purl 4 rounds. At the end of this, counting the self-rolling bit of stockinette around the hat’s edge, you should have the appearance of three welts at the hat’s bottom edge. Continue knitting until the hat measures 2.5 inches from the bottom. (Measure this with the curling edge curled. Don’t flatten it out.) On the next row knit 24 stitches, place a marker, then repeat. If you’re using DPNs, you’ll have 4 markers in your work, with the division point for the last one being the break between needles that aligns with the dangly cast-on end. If you’re using circs, you’ll have five markers in your work. On the next round, (knit 23, K2tog). Do this five times total to complete out the round. Each decrease will occur JUST BEFORE a marker. Knit 4 rounds. On the next round (knit 22, K2tog). Do this five times total to complete out the round. Knit 3 rounds. On the next round (knit 21, K2tog). Do this five times total to complete out the round. Again each decrease will occur just before a marker. Knit 2 rounds. On the next round knit to two stitches before the marker, then knit 2 tog. Do this five times total to complete out the round. Knit 1 round. From here on in every round is the same – Knit until two stitches before a marker, knit those two stitches together. Repeat to complete out the round. Keep doing this until only five stitches remain on your needles. When only five stitches remain, work them I-Cord style for five rounds, then end off. Darn in both ends.